Marie, named after my quilting grandmother, might possibly be my favorite quilt ever! Three very different blocks combine into a very dynamic whole. There is something new for everyone in this technique packed design. 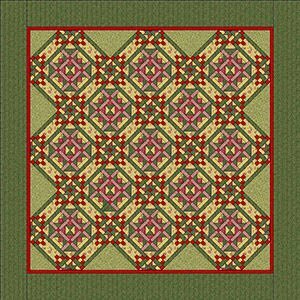 Square in a Square, partial seams, various methods of making half square triangles and much more will be taught. Pattern fee of $10.00 - pattern will be available at class. ALL DAY CLASS w/lunch break. Pattern fee of $10.00 - pattern will be available at class.